We have received 235 reviews of The Dragon with a Chocolate Heart . You can add a review or scroll down to read reviews. To send in your review of The Dragon with a Chocolate Heart , please fill in the info below and click the button labelled Send Review Now. Reviews will be checked by our team before they appear on the website. Your last name will not appear on the site, but we need to know who you are in case you win a prize! The Boy with One NameThe ExplorerJust Call Me Spaghetti-Hoop BoyLetters from the LighthouseWho Let the Gods Out? Stephanie Burgis grew up in East Lansing, Michigan, USA where she visited the library every week with her younger brothers. Stephanie’s love of fantasy began at an early age when her dad read her The Lord of the Rings as a child. Between 1999 and 2000 Stephanie was a Fulbright scholar at the University of Vienna studying music history and then went on to study opera history at the University of Leeds as a PhD student. After graduating Stephanie worked for a British opera company. She is now a full time writer. 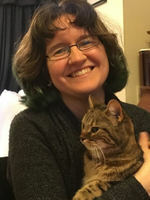 Stephanie now has a dual US/UK citizenship and lives in Wales with her husband, fellow author Patrick Samphire, their two sons and Pebbles the cat. Aventurine is the fiercest, bravest kind of dragon, and she's ready to prove it to her family by leaving the safety of their mountain cave and capturing the most dangerous prey of all: a human. But when the human she captures tricks her into drinking enchanted hot chocolate, she finds herself transformed into a puny human girl with tiny blunt teeth, no fire, and not one single claw. She's still the fiercest creature in these mountains though - and now she's found her true passion: chocolate! Stephanie has published over thirty short stories for adults and teens. Her book A Most Improper Magick won the Waverton Good Read Award for Best Début Children’s Novel by a British writer. Stephanie spent seven years living in Yorkshire. The Dragon with the Chocolate Heart was published by Bloomsbury UK on 9th February 2017. Stephanie is very close to her younger brothers. To find out more about Stephanie check out her website www.stephanieburgis.com or follow her on Twitter @stephanieburgis. I really enjoyed this book but I thought it was a too fast ending. Harry gave The Dragon with a Chocolate Heart 4 out of 5 and now plans to read Just Call Me Spaghetti-Hoop Boy by Lara Williamson. venturous and it has a mixture of reality and fantasy. Also,it is very quick and moves on quickly to the fun part. Pola gave The Dragon with a Chocolate Heart 4 out of 5 and now plans to read Just Call Me Spaghetti-Hoop Boy by Lara Williamson. nicole gave The Dragon with a Chocolate Heart 4 out of 5 and now plans to read Just Call Me Spaghetti-Hoop Boy by Lara Williamson. This is a really good book as it has lots of description and has adjective and noun phrases and I would recommend this book to you. Hafsa gave The Dragon with a Chocolate Heart 5 out of 5 and now plans to read The Explorer by Katherine Rundell. The reason I gave it a 4 out 5 is because it gives me mixed emotions. At the beginning it made me feel sad but by the end I felt happy. I prefer to read this book on a night time as it helped me relax for bed. Sky gave The Dragon with a Chocolate Heart 4 out of 5 and now plans to read The Boy with One Name by J R Wallis. The reason I gave this book a 4 out of 5 stars is because it is a very welcoming and interesting book.Personally I think this is best to read at nightfall as it puts you in a calm and relaxing mood.I like it as it is a funny,moving and deliciously full of chocolate.I loved it! Lilly-Mae gave The Dragon with a Chocolate Heart 4 out of 5 and now plans to read The Boy with One Name by J R Wallis. Dragon with the Chocolate Heart was just OK because the story didn't make sense and it was very slow at the beginning. I didn't finish this book because I was not interested in it. Aaliyah gave The Dragon with a Chocolate Heart 1 out of 5 and now plans to read The Boy with One Name by J R Wallis. I didn't like this book at all that is why I gave it a one out of five. I suggest that if you like books about dragons then read this. Hopefully you enjoy this more than me. Fatiah gave The Dragon with a Chocolate Heart 1 out of 5 and now plans to read Letters from the Lighthouse by Emma Carroll. I thoroughly enjoyed this book since it had a very interesting plot and the character Aventurine was a lot like myself since he is quite adventurous and daring. I would definitely recommend this book to children who like a lot of adventurous stories and I also would encourage the author to continue writing more stories that are as good as this one or even better. Jennifer gave The Dragon with a Chocolate Heart 4 out of 5 and now plans to read Letters from the Lighthouse by Emma Carroll. This was an amazing book with a good plot. The way it was set up was brilliant but there is somethings wrong with the book that got me a bit confused. It was whose point of view it was from. Overall this book was good and I would read it again. Seth gave The Dragon with a Chocolate Heart 4 out of 5 and now plans to read The Explorer by Katherine Rundell. Boring. Really boring. I really wouldn’t recommend this book to anyone, as I only really got into this book on Chapter 18! The only thing I enjoyed about this book is the chocolate part, but when I finished reading this, I was craving chocolate. I think that the ending is kind of cool, but I don’t think I want to read this again. Daisy gave The Dragon with a Chocolate Heart 3 out of 5 and now plans to read The Explorer by Katherine Rundell. This book was the best book in the entire Book Award series. I love how she can turn Dragon and Human at will. I really hope this wins the Leeds Book awards! Sarah gave The Dragon with a Chocolate Heart 5 out of 5 and now plans to read Just Call Me Spaghetti-Hoop Boy by Lara Williamson. i loved this book because i liked the way it showed different types of people looking for jobs and their pashion love for chocolate. Malak gave The Dragon with a Chocolate Heart 5 out of 5 and now plans to read The Boy with One Name by J R Wallis. this book is boring because to me it is not my genre. Malak gave The Dragon with a Chocolate Heart 2 out of 5 and now plans to read Just Call Me Spaghetti-Hoop Boy by Lara Williamson. I really liked this book therefore I would highly recommend it. My favourite part was when Aventurine was forced to eat cheese and milk because she stared in horror at the milk. Thomas gave The Dragon with a Chocolate Heart 5 out of 5 and now plans to read The Explorer by Katherine Rundell. I thought this book was ok;it was good at first. Then it started to get a bit boring. Katie gave The Dragon with a Chocolate Heart 3 out of 5 and now plans to read The Boy with One Name by J R Wallis. I would recommend this book to anyone who likes chocolate. I didn't really like the book because it was really good at the start but then it got a bit boring. Brooke gave The Dragon with a Chocolate Heart 3 out of 5 and now plans to read Who Let the Gods Out? by Maz Evans. Sophie gave The Dragon with a Chocolate Heart 4 out of 5 and now plans to read The Boy with One Name by J R Wallis. Sarah gave The Dragon with a Chocolate Heart 3 out of 5 and now plans to read The Boy with One Name by J R Wallis. I like this book because there was always something interesting about how she struggled to understand human life and how humans function it was very entertaining so i give it 4 out of 5 . Jasmine gave The Dragon with a Chocolate Heart 4 out of 5 and now plans to read The Boy with One Name by J R Wallis. this book started off really good but it when i got into the middle and it just a little boring and i was not really enjoying it. It was kind of confusing and i didn't like it. I wouldn't recommend this book but that is just my own personal opinion. Rebecca gave The Dragon with a Chocolate Heart 1 out of 5 and now plans to read Who Let the Gods Out? by Maz Evans. I really enjoy this book because it was adventurous and magical since a dragon went into a forest and was enchanted into a human by a food mage,she finally found her passion... it was making chocolate but when something went wrong she has to save her dragon family in order to not be killed. Freya gave The Dragon with a Chocolate Heart 5 out of 5 and now plans to read The Boy with One Name by J R Wallis. Lucy gave The Dragon with a Chocolate Heart 3 out of 5 and now plans to read The Boy with One Name by J R Wallis. My reasoning for giving this book a one is that to my it made no seance. Some may think it is great but the writing stile is just not for me. Some of the aspects just don't work making it not as good as some of the others. Benedict gave The Dragon with a Chocolate Heart 1 out of 5 and now plans to read The Boy with One Name by J R Wallis. seren gave The Dragon with a Chocolate Heart 1 out of 5 and now plans to read The Boy with One Name by J R Wallis. This is a very different from what i imagened. It wasn't really my book though I think if you like dragons then you should go and check this book out !!!!! molly gave The Dragon with a Chocolate Heart 2 out of 5 and now plans to read The Boy with One Name by J R Wallis. This story has a good moral to it. I really enjoyed this book but I think it should have a bit more to the story which is why I gave it 4 out of 5. I would recommend this book to people who love to have adventure and fun. Millie gave The Dragon with a Chocolate Heart 4 out of 5 and now plans to read The Boy with One Name by J R Wallis. This book is good for people who like fantasy and adventure. I enjoyed it because I like the idea of changing into a dragon and then back to a girl by eating chocolate! Adventurine was my favourite character because she was brave, kind and loyal. Jasmine gave The Dragon with a Chocolate Heart 4 out of 5 and now plans to read Who Let the Gods Out? by Maz Evans. This book is one of the best I have ever read. I love how it describes the taste of chocolate so delicately and how it feels to change. leo gave The Dragon with a Chocolate Heart 5 out of 5 and now plans to read The Boy with One Name by J R Wallis. I liked this book because it was interesting and fun.The thing that was interesting was the bit where Aventurine transforms into a dragon when she drinks the Hot Chocolate from the food mage! Layla gave The Dragon with a Chocolate Heart 4 out of 5 and now plans to read The Boy with One Name by J R Wallis. This book was quite boring in my opinion, as it jumps to conclusions with no explanation of what is going on. I would recommend this book to people who like fantasy and have an imagination. Imaani gave The Dragon with a Chocolate Heart 5 out of 5 and now plans to read Letters from the Lighthouse by Emma Carroll. Zainab gave The Dragon with a Chocolate Heart 1 out of 5 and now plans to read The Explorer by Katherine Rundell. I loved this book because its just so sweet and loved it and you should reading this book. If you love chocolate then read this book. Alveena gave The Dragon with a Chocolate Heart 5 out of 5 and now plans to read The Explorer by Katherine Rundell. This book sparked an adventure inside mah heart. It also made me more ambitious towards my hopes and dreams.????? Ellie gave The Dragon with a Chocolate Heart 4 out of 5 and now plans to read The Boy with One Name by J R Wallis. Laibah gave The Dragon with a Chocolate Heart 3 out of 5 and now plans to read The Boy with One Name by J R Wallis. rhianne gave The Dragon with a Chocolate Heart 3 out of 5 and now plans to read Letters from the Lighthouse by Emma Carroll. I really liked this book it made me really want to eat some chocolate and it kept me hooked I liked how the dragon was so brave and eager to face the world it reminded of growing up. David gave The Dragon with a Chocolate Heart 5 out of 5 and now plans to read The Boy with One Name by J R Wallis. I partly liked this book because there is lots of amazing language and there is dragons which I kind of like but also there is a boring side of the book but it is an alright book. Ethan gave The Dragon with a Chocolate Heart 4 out of 5 and now plans to read The Boy with One Name by J R Wallis. Idalia gave The Dragon with a Chocolate Heart 4 out of 5 and now plans to read Who Let the Gods Out? by Maz Evans. I gave this book a 4 out of 5 because it was quite funny but also a bit boring at the beginning. It was quite interesting too. I liked the part when she worked at the chocolate shop . Ruby gave The Dragon with a Chocolate Heart 4 out of 5 and now plans to read The Boy with One Name by J R Wallis. Molly gave The Dragon with a Chocolate Heart 3 out of 5 and now plans to read Who Let the Gods Out? by Maz Evans. I enjoyed the first part of this book, however it started to get boring I didn’t love love it , it was ok,if you like stories about dragons and especially chocolate. I liked the mix between dragons and chocolate it was very imaginative. Gabriella gave The Dragon with a Chocolate Heart 4 out of 5 and now plans to read Who Let the Gods Out? by Maz Evans. Lukas gave The Dragon with a Chocolate Heart 4 out of 5 and now plans to read Who Let the Gods Out? by Maz Evans. This book is about a female dragon who wants to prove to her mum and dad that she's ready to capture things.So she goes out of the cave in the mountain and captures a human.Suddenly the human tricks her into drinking magical hot chocolate that turns her into a human with blunt teeth and no fire but a lover of chocolate. bailey gave The Dragon with a Chocolate Heart 4 out of 5 and now plans to read The Boy with One Name by J R Wallis. Lilyanna gave The Dragon with a Chocolate Heart 5 out of 5 and now plans to read Just Call Me Spaghetti-Hoop Boy by Lara Williamson. This book is quite magical but sometimes lacked pace . You would like this book if you were into fantasy and adventures . It is very descriptive . skylar gave The Dragon with a Chocolate Heart 3 out of 5 and now plans to read Just Call Me Spaghetti-Hoop Boy by Lara Williamson. millie gave The Dragon with a Chocolate Heart 2 out of 5 and now plans to read Letters from the Lighthouse by Emma Carroll. It was a magical book although quite boring at times. It was very descriptive and good. It did not have a ending as much as other books. any one who enjoys fantasy will really enjoy this book but for me it was not my favorite. Erin gave The Dragon with a Chocolate Heart 2 out of 5 and now plans to read The Explorer by Katherine Rundell. this book was not the best book! william gave The Dragon with a Chocolate Heart 1 out of 5 and now plans to read Letters from the Lighthouse by Emma Carroll. Lily gave The Dragon with a Chocolate Heart 5 out of 5 and now plans to read The Boy with One Name by J R Wallis. For me this book wasn't great it was boring and nothing really happened in it and agreeing with others the start was very rushed. Lara gave The Dragon with a Chocolate Heart 2 out of 5 and now plans to read The Explorer by Katherine Rundell. I liked this book because it wasn’t like anything I had read or heard of before. Hannah gave The Dragon with a Chocolate Heart 3 out of 5 and now plans to read The Explorer by Katherine Rundell. Ava gave The Dragon with a Chocolate Heart 3 out of 5 and now plans to read The Boy with One Name by J R Wallis. I like this book because it is very funny in the way of not knowing. The main character is a dragon called Adventurine and something happens along the way which helps her discover her true passion in life. I recommend this to Humor and Fantasy Lovers. Jakub gave The Dragon with a Chocolate Heart 5 out of 5 and now plans to read Who Let the Gods Out? by Maz Evans. A fabulous book about DRAGONS,FAMILY and OF COURSE CHOCOLATE!!!! !I loved reading it !!! Francesca gave The Dragon with a Chocolate Heart 4 out of 5 and now plans to read The Boy with One Name by J R Wallis. I really enjoyed reading this book as it showes the power of creating your own passion and following your dreams. Abigail gave The Dragon with a Chocolate Heart 5 out of 5 and now plans to read The Explorer by Katherine Rundell. Ruby gave The Dragon with a Chocolate Heart 5 out of 5 and now plans to read The Boy with One Name by J R Wallis. This has been my least favourite book of all 5 I have read but I really liked how it mentions the huge amounts of chocolate- I now have a favourite word:chocolatier. Ava gave The Dragon with a Chocolate Heart 3 out of 5 and now plans to read The Explorer by Katherine Rundell. Although I like Adventurine and her fiery temper I felt too hungry for chocolate and I was too angry about the horrible Greta.However it encourages you to follow your dreams and passions.I also like seeing the story from a dragons point of view. Katy gave The Dragon with a Chocolate Heart 3 out of 5 and now plans to read Who Let the Gods Out? by Maz Evans. This is a heart-warming story about friendship,dragons & chocolate! My favorite character is Aventurine because she is kind,adventurous and sticks up for humans even though it causes family difficulties for her.This book tells an important lesson about being a loyal friend know matter the difficulties of the situation. This story tells about giving every one a go which ever form you're in. carmen gave The Dragon with a Chocolate Heart 5 out of 5 and now plans to read Letters from the Lighthouse by Emma Carroll. This book is very interesting as you don,t usually think about how a dragon would respond if they were turned into a human.It is a magnificent mixture of dragons and chocolate. Taya gave The Dragon with a Chocolate Heart 4 out of 5 and now plans to read The Explorer by Katherine Rundell. It just had a bit of a slow start to the book.That is the only reason it wasn't full marks. Amelia gave The Dragon with a Chocolate Heart 4 out of 5 and now plans to read The Boy with One Name by J R Wallis. Ruby gave The Dragon with a Chocolate Heart 4 out of 5 and now plans to read Letters from the Lighthouse by Emma Carroll. Amreli gave The Dragon with a Chocolate Heart 4 out of 5 and now plans to read The Boy with One Name by J R Wallis. Noah gave The Dragon with a Chocolate Heart 3 out of 5 and now plans to read The Boy with One Name by J R Wallis. course very chocolately. I would definitely recommend this for other chocolate lovers. Swaley gave The Dragon with a Chocolate Heart 4 out of 5 and now plans to read The Boy with One Name by J R Wallis. I like this book because the dragon eats chocolate for the first time and there is a first time for everything. I recommend this book to people who like fantasy and people who like books that are not real. Mazey gave The Dragon with a Chocolate Heart 3 out of 5 and now plans to read The Boy with One Name by J R Wallis. I enjoyed this book as it was exciting and adventurous however I found it rather hard to get into. All in all though,it was very enjoyable to read(full of chocolate). Lily gave The Dragon with a Chocolate Heart 3 out of 5 and now plans to read Who Let the Gods Out? by Maz Evans. izzy gave The Dragon with a Chocolate Heart 1 out of 5 and now plans to read Who Let the Gods Out? by Maz Evans. This book is about a dragon called Aventurine.She is turned into a human and wanted to find her passion in life.She found chocolate and it ended up being her favourite food.At the beginning of the book,I didn't like it because the talking of chocolate was repetitive but from the halfway point it got better.This book is not a page turner but I enjoyed it anyway.I would recommend this book to people who like chocolate. Riya gave The Dragon with a Chocolate Heart 2 out of 5 and now plans to read The Boy with One Name by J R Wallis. This book Is about a dragon called adventurine.She is turned into human and wants to find her passion.It turns out that her passion was chocolate when she had found some.I didn't like this book because it was repetitive and you couldn't picture it.Also this book is not a page Turner.I recommend this book to people who like chocolate and if they don't,don't read it! Logan gave The Dragon with a Chocolate Heart 1 out of 5 and now plans to read The Boy with One Name by J R Wallis. Jake gave The Dragon with a Chocolate Heart 4 out of 5 and now plans to read The Boy with One Name by J R Wallis. I probably wouldn't recommend this book but it is a good book but nothing really happens in it. If the author is thinking of writing a new book i would focus on a bit more mystery. I also think that the start is a bit rushed. Ellen gave The Dragon with a Chocolate Heart 3 out of 5 and now plans to read The Explorer by Katherine Rundell. I Didn't enjoy this book at all. I've read books WAY better than this. I think it just wasn't my flavour. I think this book would be better for younger children. Abigail gave The Dragon with a Chocolate Heart 1 out of 5 and now plans to read Letters from the Lighthouse by Emma Carroll. I really enjoyed this book as it had a catchy title and I really like that the dragon had a chocolate heart. It was different to the other books I read at home. This is a really good book and I recommended it to people who are adventurous will like this book. Louise gave The Dragon with a Chocolate Heart 5 out of 5 and now plans to read The Explorer by Katherine Rundell. I liked this book but it got boring after a while but it would be good for you if you like mythical creatures . So if you read this book I'm sure you will enjoy it. Millie gave The Dragon with a Chocolate Heart 3 out of 5 and now plans to read Just Call Me Spaghetti-Hoop Boy by Lara Williamson. This is a good book because the dragon couldn't fit in the cave when they go on the adventure . As well it has a good storyline! emily gave The Dragon with a Chocolate Heart 5 out of 5 and now plans to read Letters from the Lighthouse by Emma Carroll. I liked this book because it was very adventurous and quiet funny seeing aventurine learn the human ways. I thought it would be childish but it wasn't really. I would love to have a friend like silke because she always has your back. I recommend this book to people 9 or 10. Sarah gave The Dragon with a Chocolate Heart 5 out of 5 and now plans to read The Boy with One Name by J R Wallis. I enjoyed this book. A few of these books are slow starters and this was one of them. If you keep reading on and try not to put it back down, it gets better. A lot. It is about a dragon called Aventurine who wants to prove her family wrong about her being too young to go outside. While she does, she gets caught up in trouble which turns her in to a human! On the way she meets plenty of new friends who she trusts and has a strong friendship with. I really liked this book and I would recommend it to others. Mia gave The Dragon with a Chocolate Heart 3 out of 5 and now plans to read The Boy with One Name by J R Wallis. it is a bit boring. It is about a dragon who drinks hot chocolate and turns into a human and her quest is to turn back into a dragon to see her family. I would definitely recommend this book. Kayra gave The Dragon with a Chocolate Heart 4 out of 5 and now plans to read The Boy with One Name by J R Wallis. This book had a good start until it got near to the middle. But when I got into the middle it started to get very boring. The thing was, it brought your hopes up in the begging and end but the book for me let itself down near the middle. Dania gave The Dragon with a Chocolate Heart 2 out of 5 and now plans to read Just Call Me Spaghetti-Hoop Boy by Lara Williamson. I rated this book 5 out of 5 because I like how Aventurine knows nothing about humans' life and how she adapts to her surroundings. I did not think that it was a challenging book, but it is a great read for absolutely anybody. Alistair gave The Dragon with a Chocolate Heart 5 out of 5 and now plans to read Letters from the Lighthouse by Emma Carroll. I didn'really like this book and I found it a bit boring. Im not really sure what to say about the book. I suggest this book to everyone! I hope YOU enjoy this book. Goodbye! Natasha gave The Dragon with a Chocolate Heart 1 out of 5 and now plans to read Letters from the Lighthouse by Emma Carroll. I rated this book 3 out of 5 because it said something and then it droned on and on. I also didn't like it because it didn't have chapter names. Finally because I didn't really understand it, but I liked it because it had good setting description and a good beginning. That is why I rate it a 3.
james gave The Dragon with a Chocolate Heart 3 out of 5 and now plans to read The Boy with One Name by J R Wallis. This book is very interesting and inspires imagination. Children who want to write their own book should read this. I especially like that Adventurine can turn into a human as well as a dragon. People who like fantasy and dragon stories read this, it is fantastic! Azira gave The Dragon with a Chocolate Heart 5 out of 5 and now plans to read The Explorer by Katherine Rundell. This book was amazing,especially at the start when Aventureine gets transformed into a human. I really liked it when she drinks hot chcolate to be able to tranform into a girl and a dragon. I say this again becuase i've said it in all my other reviewed books, definitley my favourite book so far in the 9-11 catagory. I just love this book so much! Sarah gave The Dragon with a Chocolate Heart 4 out of 5 and now plans to read The Boy with One Name by J R Wallis. This book enticed me in with the vivid front cover and kept me engrossed with a powerful story-line. The only downside to the book is all the talk about chocolate - it made me hungry! I found this book to be very unique as I have read no other book like this before which is why I would recommend it to 8-12 year olds (a very family-friendly book) 5/5 from me! Amelia gave The Dragon with a Chocolate Heart 5 out of 5 and now plans to read The Boy with One Name by J R Wallis. The book was a lot more interesting at the beginning as it went from a dragon soaring through the skies to a little girl around my age on a journey to a chocolate factory.I have enjoyed the books I have read so far a bit more than this one because it's not really my type, but I would recommend to people interested in fantasy. Maisie gave The Dragon with a Chocolate Heart 3 out of 5 and now plans to read Who Let the Gods Out? by Maz Evans. This book was good but didn't quite get me into the story. It is a really good book but the characters are not described very well. I think the opening is the best part . My favourite character in the book is Jasper as he studies humans as a dragon and Aventurine gets to be one!!!!!! I would definitely recommend this book to everyone who likes unpredictable stories! RORY gave The Dragon with a Chocolate Heart 3 out of 5 and now plans to read The Boy with One Name by J R Wallis. it was full of chocolate i liked it because it was adventurous an amassing. It was about a girl who was a girl dragon but then she turned in to a human girl. also tells us a bit about the past. lillie gave The Dragon with a Chocolate Heart 4 out of 5 and now plans to read The Boy with One Name by J R Wallis. I really enjoyed this book because it was unusual but fun and filled with chocolate.It was not like any book i have ever read befor and that is manly why i liked it.In this book my favourt character would have to be Aventurine because she is kind and curious. Isobel gave The Dragon with a Chocolate Heart 4 out of 5 and now plans to read The Boy with One Name by J R Wallis. I really enjoyed this book because its quite unusual and they eat drink enchanted chocolate. I really like chocolate so this book is for me. It is not my favorite but it came really close. it was just really enjoyable and just really good! This book is really good. A gripping story full of adventure. Aventurine is desperate for chocolate. This book just shows how important family is. Aventurine thinks life isn't fair and that her Mum pays more attention to her sister more than her. Lily gave The Dragon with a Chocolate Heart 4 out of 5 and now plans to read The Explorer by Katherine Rundell. I enjoyed this book however at the beginning it was slightly boring. Although near the end, it became more and more interesting. This was a heart-warming book and was amazing because it included chocolate! I recommended this to people who love a heart-warming book. Overall a great book. Victoria gave The Dragon with a Chocolate Heart 3 out of 5 and now plans to read Who Let the Gods Out? by Maz Evans. This book was amazing. I love fantasy and chocolate so it was perfect. It was cool how you could experience Aventurine's feelings about other people and it introduced myself to a new perspective. I would have liked a bit more action and adventure near the end but it still was a really good book. Overall I loved reading this book and when I was reading it, I couldn't stop! Onella gave The Dragon with a Chocolate Heart 4 out of 5 and now plans to read The Explorer by Katherine Rundell. I liked this book but I found it hard to follow the story line and I didn't like it as much as some people might. I expected more from the book but I would recommend it to mythical creature lovers and adventurous readers. It wasn't my type of book. Connor gave The Dragon with a Chocolate Heart 3 out of 5 and now plans to read The Explorer by Katherine Rundell. I liked this book because it was a heartwarming tale of Aventurine the dragon who got turned human but then found her passion in making chocolate.The thing I didn't like about this book that I thought the start was a little bit rushed but overall I thought it was a good book! Anand gave The Dragon with a Chocolate Heart 4 out of 5 and now plans to read The Boy with One Name by J R Wallis. It was great but horrid at the same time. I loved it, but why I didn't like it at the same time was because she wasn't with her family. Scarlett gave The Dragon with a Chocolate Heart 5 out of 5 and now plans to read Who Let the Gods Out? by Maz Evans. I really enjoyed this book because it was just AMAZING!!!! I don’t know how but I found this relatable (which is strange because it’s about a dragon, but there you go!). I was thoroughly surprised with this book and in a good way. For the amazing use of chocolate and dragons I give this book 5 out of 5! Danielle gave The Dragon with a Chocolate Heart 5 out of 5 and now plans to read The Explorer by Katherine Rundell. Darcey gave The Dragon with a Chocolate Heart 3 out of 5 and now plans to read Just Call Me Spaghetti-Hoop Boy by Lara Williamson. this book is amazing,after i read the first page i couldn't stop reading it. in this book it makes me want to read more and more every chapter to see what would happen next. Even though i was a bit angry with the man for tricking the dragon it is still an incredible book. i couldn't believe how curious the dragon was about leaving the cave. #amazing #love this book #please make a sequel. lauren gave The Dragon with a Chocolate Heart 4 out of 5 and now plans to read The Explorer by Katherine Rundell. The dragon with a chocolate heart is a very interesting book. I didn't like it when I saw the cover as it looked a bit childish but when I read it I thought it was good! Samir gave The Dragon with a Chocolate Heart 4 out of 5 and now plans to read The Boy with One Name by J R Wallis. an amazing book I loved it especially since it was written in 1st person. ife gave The Dragon with a Chocolate Heart 5 out of 5 and now plans to read The Boy with One Name by J R Wallis. At the start of the book it really bored me but I'm exited to read the last part and find out what happens next. Sophie gave The Dragon with a Chocolate Heart 4 out of 5 and now plans to read Letters from the Lighthouse by Emma Carroll. it is a brilliant yet touching book and really makes you think that dragons are not really what they seem to be! milly gave The Dragon with a Chocolate Heart 5 out of 5 and now plans to read The Explorer by Katherine Rundell. I love this book however it didn't really hook me in. I recommend it to people who like a bit of adventure! Anjali gave The Dragon with a Chocolate Heart 4 out of 5 and now plans to read The Boy with One Name by J R Wallis. The Dragon with a Chocolate Heart was amazing. I loved how it showed a dragon's life from a human's view. It was also funny to read when Adventurine acts stubborn and creates the scene. I also especially liked the variety of emotions it had in it. I would definitely recommend this book as it is amazing. Anshika gave The Dragon with a Chocolate Heart 5 out of 5 and now plans to read Just Call Me Spaghetti-Hoop Boy by Lara Williamson. I really loved this book. It was amazing because I love the fact that the author of this book put chocolate in it unlike any other author. lelannah gave The Dragon with a Chocolate Heart 5 out of 5 and now plans to read The Boy with One Name by J R Wallis. I want to say how awesome this book was, and how it made adrenaline rush through my body.I totally loved it- I would read it again. Fatima gave The Dragon with a Chocolate Heart 5 out of 5 and now plans to read Who Let the Gods Out? by Maz Evans. I gave this book a 4 out of 5, because I thought the character Aventurine was very determined to get her dream job as a chocolate maker the only reason I rated it 4 not 5 is because I thought the start was rushed, but overall I thought it was a very good book!!! Isabella gave The Dragon with a Chocolate Heart 4 out of 5 and now plans to read Letters from the Lighthouse by Emma Carroll. I thought it was a great book because it's got loads of surprises,at the start. I really like that is has so many different surprises and you can never guess what is going to happen next! A great read! Harry gave The Dragon with a Chocolate Heart 4 out of 5 and now plans to read The Boy with One Name by J R Wallis. This book was very moving and deliciously full of chocolate I loved it! A magical treat of dragons and heroines with all the best possible flavours. It is my favourite book so far. It was very exiting and I would recommend this book to ages 7-12 because of the child friendly dramas. Katie Lee gave The Dragon with a Chocolate Heart 4 out of 5 and now plans to read Letters from the Lighthouse by Emma Carroll. Oliver gave The Dragon with a Chocolate Heart 5 out of 5 and now plans to read Just Call Me Spaghetti-Hoop Boy by Lara Williamson. I liked this book but it was a little bit boring in the middle of the book but it was good and I enjoyed it. Oscar gave The Dragon with a Chocolate Heart 4 out of 5 and now plans to read Letters from the Lighthouse by Emma Carroll. I liked this book a lot and it is definitely better than Letters from the Lighthouse. It is really good because it's all about a dragon with a passion for chocolate. My favourite character is Silkie because she is mischievous and clever. She also helps Aventurine find her way. I would reccomend this book to anyone who loves chocolate. Rosie gave The Dragon with a Chocolate Heart 4 out of 5 and now plans to read Just Call Me Spaghetti-Hoop Boy by Lara Williamson. Personally I think this book is fantastic and also sad. It has lots of unexpected parts.I recommend this book a lot. Elton gave The Dragon with a Chocolate Heart 4 out of 5 and now plans to read The Explorer by Katherine Rundell. I recommend this book to people that like fantasy .I also think that this is more for boys.But i think it was quite exiting near the end because it brought tears to my eyes.So i give this 4 out of 5 stars. Sienna gave The Dragon with a Chocolate Heart 4 out of 5 and now plans to read The Boy with One Name by J R Wallis. I definitely enjoyed this book. I rated this a five because it was beyond my expectations I really didn't expect it to be that amazing. I would definitely recommend this book to other readers. Juliette gave The Dragon with a Chocolate Heart 5 out of 5 and now plans to read The Boy with One Name by J R Wallis. This book brought tears to my eyes, it was so lovely. I couldn't put it down for one second. My favorite part was when all the dragons tried the Chocolate. Samuel gave The Dragon with a Chocolate Heart 5 out of 5 and now plans to read Just Call Me Spaghetti-Hoop Boy by Lara Williamson. Paige gave The Dragon with a Chocolate Heart 4 out of 5 and now plans to read The Boy with One Name by J R Wallis. It was ok, I love the imagination behind it and the dragons. It's not the book for me, but I suspect some of my friends would really enjoy it! Bronwen gave The Dragon with a Chocolate Heart 3 out of 5 and now plans to read Just Call Me Spaghetti-Hoop Boy by Lara Williamson. I found that the front cover was pulling me in but the book itself wasn’t, I thought this would be a fascinating book but found that I wouldn’t read it again. Chloe gave The Dragon with a Chocolate Heart 3 out of 5 and now plans to read Letters from the Lighthouse by Emma Carroll. Jamie gave The Dragon with a Chocolate Heart 4 out of 5 and now plans to read The Explorer by Katherine Rundell. The dragon with a chocolate heart is an amazing book with an interesting background. Adventurine is such an amazing character! Humayra gave The Dragon with a Chocolate Heart 5 out of 5 and now plans to read Just Call Me Spaghetti-Hoop Boy by Lara Williamson. ali gave The Dragon with a Chocolate Heart 4 out of 5 and now plans to read Who Let the Gods Out? by Maz Evans. I loved the book 'The Dragon with a Chocolate Heart' as there is perfect language, it is extremely descriptive and the characters are brilliant. the book was highly amusing as it was hilarious to see a humans' life from a dragon's perspective, as the book does. Izzah gave The Dragon with a Chocolate Heart 5 out of 5 and now plans to read The Boy with One Name by J R Wallis. This book is amazing. It is about a girl dragon called Adventurine who gets turned into a human. Everyone in the city is against the dragons but Adventurine needs to stop the humans from attacking the dragons. I would recommend this book to people who like adventure stories. Samantha gave The Dragon with a Chocolate Heart 5 out of 5 and now plans to read Who Let the Gods Out? by Maz Evans. I really liked this book because it was nice to read and I love love love chocolate which makes it even better! This book was quite challenging to read therefore it took me quite a while to read. I would recommend this book to younger readers who enjoy fantasy fiction books. Lexi gave The Dragon with a Chocolate Heart 5 out of 5 and now plans to read Letters from the Lighthouse by Emma Carroll. I really liked the dragon with a chocolate heart because i really like dragons and chocolate. I also really like how it is kinda mythical and i really like mythical stories! Beau gave The Dragon with a Chocolate Heart 5 out of 5 and now plans to read Letters from the Lighthouse by Emma Carroll. I liked this book but it didn't really hook me in. Due to this, it took me much longer to read this book than the others. Jaiya gave The Dragon with a Chocolate Heart 4 out of 5 and now plans to read The Explorer by Katherine Rundell. i rate this book 4 stars because it had som e good description but didnt have as much as i would have hoped for.This book should be rated 9-13 because some of the words were easy but then there was some i really struggled with .i think you would really enjoy this. kasey gave The Dragon with a Chocolate Heart 4 out of 5 and now plans to read The Explorer by Katherine Rundell. I really liked it and it's really funny I do recommend it. Anya gave The Dragon with a Chocolate Heart 5 out of 5 and now plans to read Who Let the Gods Out? by Maz Evans. The dragon with a chocolate heart's characters are just brilliant . You can really picture the story in your mind's eye. 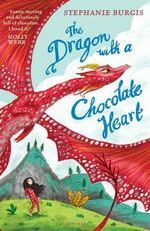 Dragons and chocolate are two of my favourite things to read about,and this lovely book combines the two! Holly gave The Dragon with a Chocolate Heart 5 out of 5 and now plans to read Who Let the Gods Out? by Maz Evans. ELijah-Jay gave The Dragon with a Chocolate Heart 1 out of 5 and now plans to read The Explorer by Katherine Rundell. Gabriel gave The Dragon with a Chocolate Heart 4 out of 5 and now plans to read The Boy with One Name by J R Wallis. I really did not enjoy this book.I do not think it added up properly and thought it a bit childish. However I did like the conflict between the mages and the dragon. Tormaigh gave The Dragon with a Chocolate Heart 1 out of 5 and now plans to read Who Let the Gods Out? by Maz Evans. This book had a gradual start until I got into it, at first, it was boring. But when I got into the middle and she was working at the Chocolate Heart Shop I really enjoyed it. The thing was, it brought your hopes up in it, but then it all went wrong, that was the good part. They started from the beginning but then carried on. David gave The Dragon with a Chocolate Heart 4 out of 5 and now plans to read Just Call Me Spaghetti-Hoop Boy by Lara Williamson. I thought this book was okay but it got a little boring as I went along. Darcey gave The Dragon with a Chocolate Heart 3 out of 5 and now plans to read The Explorer by Katherine Rundell. This was the 2nd Leeds Book Award book I read. Even if I didn't have to read Dragon with a Chocolate Heart, I would have read it anyway because I like dragons and chocolate. I liked it because it had creative language, a good plot and it was easy to read. Caitlin gave The Dragon with a Chocolate Heart 4 out of 5 and now plans to read Just Call Me Spaghetti-Hoop Boy by Lara Williamson. This book is really funny. I love when it talks about face fur. It made me giggle when it said he slowly raised his brown face fur. It was just the perfect type of book for me and I will definitely recommend this to my class mates when it comes out. Amber gave The Dragon with a Chocolate Heart 5 out of 5 and now plans to read Letters from the Lighthouse by Emma Carroll. It was really exciting and cool. Tilly gave The Dragon with a Chocolate Heart 5 out of 5 and now plans to read Just Call Me Spaghetti-Hoop Boy by Lara Williamson. This book had a slow start, and didn't always make sense. But, it gets better and at the end there is a brilliant surprise. I would recommended this book to anyone who likes books of fantasy/adventure, or who is around my age. Caitlin gave The Dragon with a Chocolate Heart 3 out of 5 and now plans to read Who Let the Gods Out? by Maz Evans. The Dragon with a Chocolate Heart is a story about a young but adventurous dragon called Adventurine. Adventurine's siblings love reading and writing; yet all Adventurine wants to do is hunt in the mountains. One day,Adventurine sneakily escaped from her cave, and went out onto the mountains. During her adventure, she met a human who gave her some magical hot chocolate which changed her life forever. I found this book a little hard to get into because it is not very believable,however kids around 9-10 years old who like fantasy stories would probably devour this book.I think it was very well-written but it just wasn't my cup of tea. The Dragon with a Chocolate Heart was a book full of magic,adventures and chocolate.Out of all the characters I mostly adored Aventurine because when she first tasted chocolate,she realized what she loved the most. I mostly enjoyed the part of the book when Aventurines family(the dragons) searched for their daughter but after they found her, Aventurines mother still allowed her daughter to work at the Chocolate House.I would recommend this book to lovers of magic and adventure. Zuzia gave The Dragon with a Chocolate Heart 4 out of 5 and now plans to read Letters from the Lighthouse by Emma Carroll. This book was amazing; it was filled with all the nutmeg sweetness ,a vanilla essence and had fiery plots full of dried chilli powder. Drew gave The Dragon with a Chocolate Heart 4 out of 5 and now plans to read The Boy with One Name by J R Wallis. Good words in the book was not the greatest book out of all of them.Brilliant title and connectives. Rudee gave The Dragon with a Chocolate Heart 2 out of 5 and now plans to read The Boy with One Name by J R Wallis. This book was AMAZING! It was set in a world of fantasy and history, and was so beautiful. The main message of the story is family acceptance and finding your passion, which is a wonderful meaning, and the descriptions of chocolate are mouth watering. Lauren gave The Dragon with a Chocolate Heart 5 out of 5 and now plans to read Just Call Me Spaghetti-Hoop Boy by Lara Williamson. Isobel gave The Dragon with a Chocolate Heart 4 out of 5 and now plans to read The Explorer by Katherine Rundell. This book was amazing! Other people didn't seem to enjoy it but I definitely did! I liked the end when she can have both families she wants! I definitely recommend this book to all people! Charlotte gave The Dragon with a Chocolate Heart 5 out of 5 and now plans to read Who Let the Gods Out? by Maz Evans. So far I am loving this book, and the fact there is yummy chocolate involved. So far I am on chapter 6 but it has already got me hooked I will be posting a review when I have finished the book! Laila gave The Dragon with a Chocolate Heart 4 out of 5 and now plans to read The Boy with One Name by J R Wallis. I am enjoying this book very much because it hooks the reader and I am only on page 31! I think I will definitely enjoy this book! Alex gave The Dragon with a Chocolate Heart 4 out of 5 and now plans to read Letters from the Lighthouse by Emma Carroll. This book is an adventurous book with quite a lot of fantasy. I am not that sure if I am addicted to it because some parts are exciting but some are abit boring. They are some exciting bits that I like that pop up out of know where and then it changes the whole story! I really like the character adventurine because it's a really adventurous character and gets tricked into doing something later in the book. Georgia gave The Dragon with a Chocolate Heart 3 out of 5 and now plans to read The Boy with One Name by J R Wallis. I enjoyed The Dragon with a Chocolate Heart because itâ€™s really funny and adventurous. Itâ€™s about a dragon called Aventurine who got tricked into drinking delicious and enchanted hot chocolate that transformed her to a human girlâ€¦ Then she found her passionâ€¦ chocolate! My favourite part is when Aventurine drinks the hot chocolate that she made by herself. I rate it a 5/5 because itâ€™s my favourite book and I hope it wins the Leeds Book Awards! The Dragon with a Chocolate Heart is a childrenâ€™s book written by Stephanie Burgis. This book is about a girl who was originally a dragon. She is not allowed to go out of a mountain where her family lives. One day she ignores her family rules and goes out into the wilderness. Later on, she comes across a human who she wants to kill. When she sniffs the pure smell of hot chocolate she is tricked by a mage into drinking some. This turns her into a human. I enjoyed this book and I would rate it 4 Â½ out of 5. Matthew gave The Dragon with a Chocolate Heart 4 out of 5 and now plans to read The Boy with One Name by J R Wallis. This book had all the perfect ingredients it had: friendship, fun, adventure, family and topped with the perfect ingredient chocolate! This book was a great read with surprises on every beautifully written page. I adored this book! Maisy gave The Dragon with a Chocolate Heart 5 out of 5 and now plans to read Letters from the Lighthouse by Emma Carroll. I really liked the book and it is great for people who like Adventure stories. I would definetley reccomend this book to people from the age 8-11. My favourite part is when the dragon drinks the potion because it just makes you wonder what will happen next. Its a great story that i would read over and over again and never get board. Kara-Leigh gave The Dragon with a Chocolate Heart 3 out of 5 and now plans to read Just Call Me Spaghetti-Hoop Boy by Lara Williamson. I loved this book! It was action- packed and riveting. This book is about a young, fierce dragon (Aventurine) who is tricked into drinking enchanted chocolate and becomes a ... HUMAN! My favourite part was when Aventurine gets accepted into a chocolate house by Marina , an equally strong,sassy girl like Aventurine. Aventurine gets to meet another very good friend who is just as strong willed as her, and together they go on many incredible adventures. This book was definitely worth a read, but be aware ... you may get many chocolate cravings. Lucy gave The Dragon with a Chocolate Heart 5 out of 5 and now plans to read Just Call Me Spaghetti-Hoop Boy by Lara Williamson. I only gave this book 3 stars because I did not get most of it and found it a bit boring.I found the relationship between a dragon and a human a bit strange. Emily gave The Dragon with a Chocolate Heart 3 out of 5 and now plans to read Just Call Me Spaghetti-Hoop Boy by Lara Williamson. I loved this book it is a very good book with lots of adventure in it.It is all about chocolate and I love chocolate.My favourite character is Aventurine because she is brave. I recommend this book because it is interesting and makes me want to read on. kelsey gave The Dragon with a Chocolate Heart 5 out of 5 and now plans to read The Boy with One Name by J R Wallis. The thing I liked the most about this novel, was the dragon and the expanded noun phrases used to describe him. The author creates tension by involving hunting scenes with huge sense of danger. I really wanted to know what would happen next or if the characters would survive. Aisha gave The Dragon with a Chocolate Heart 3 out of 5 and now plans to read Who Let the Gods Out? by Maz Evans. At first I was not fond of the book ,but it suddenly changed. Though I soon got sucked into the amazing world of chocolate and dragons. The book was amazing it had a beautiful description and marvelous detail. Samantha gave The Dragon with a Chocolate Heart 5 out of 5 and now plans to read Just Call Me Spaghetti-Hoop Boy by Lara Williamson. Matilda gave The Dragon with a Chocolate Heart 4 out of 5 and now plans to read The Boy with One Name by J R Wallis. # Hello I did enjoy this book I would recommend this to 9 - 12 year oldS . I hope you like this book if you ARE interested . I'm not going to spoil this for you as you might WANT TO READ THIS BOOK. BYE . Amy gave The Dragon with a Chocolate Heart 4 out of 5 and now plans to read The Boy with One Name by J R Wallis. The book was about a dragon called Adventurine , who was the fiercest dragon in the mountains. She got tricked into drinking human hot chocolate which soon became her passion! My favourite part was when her parents saved her from going far away with humans. However I didn't like the part when the human/dragon wanted to have a chocolate job but the humans didn't let her get the job at the chocolate house because they said she was to ugly to get the job. I would recommend this book to an adventurous person and it is perfect for me because I love adventurous and mysterious books! I didn't really like this book because all it was about was chocolate mostly and I thought it was really boring! Rhys gave The Dragon with a Chocolate Heart 2 out of 5 and now plans to read The Boy with One Name by J R Wallis. I really like the book, the description isnâ€™t too long and the blurb fits the book really well as it leaves it as a mystery as what happens next and each chapter is amazing; I could not even put the book down! Mary-Ann gave The Dragon with a Chocolate Heart 5 out of 5 and now plans to read Just Call Me Spaghetti-Hoop Boy by Lara Williamson. I loved this book because it had a really good plotline,brilliant characters and it was full of chocolate. 5/5 and 5 star. Seren gave The Dragon with a Chocolate Heart 5 out of 5 and now plans to read The Boy with One Name by J R Wallis. At first I thought I would quite like the book but as I read on I started to get a bit bored.As I got nearer the end I started getting into it more but still I didnâ€™t really want to read on. The title of the book surprised me because it is not actually about a dragon with a chocolate heart. But I can see now that the title in some way relates to the story. If you enjoy fantasy stories this book would be for you. Isabelle gave The Dragon with a Chocolate Heart 3 out of 5 and now plans to read Who Let the Gods Out? by Maz Evans. I did not enjoy this book because it was very unrealistic and would only give it a 3/5. It is about a dragon who lives in the mountain but she got tricked into drinking enchanted hot chocolate. How will she survive in a busy city? Will her family come looking for her? Will she get what she most wants? CHOCOLATE. I would recommend this book for 7+. Skye gave The Dragon with a Chocolate Heart 3 out of 5 and now plans to read Who Let the Gods Out? by Maz Evans. Jessica gave The Dragon with a Chocolate Heart 5 out of 5 and now plans to read Who Let the Gods Out? by Maz Evans. The blurb of this book was short but made me really want to read on.I loved the part where the main character in this story was a dragon at first but then got changed into a human and had a chance to be an apprentice chocolatier! This book is definitely worth being rated 5/5! Layla gave The Dragon with a Chocolate Heart 5 out of 5 and now plans to read The Boy with One Name by J R Wallis. I really enjoyed it the only problem was that the begining was a bit slow and the ending wasn't super clear, However it was better than i thought it was going to be.My favourite bit was when the king came to the shop.AMAZING! Rosie gave The Dragon with a Chocolate Heart 3 out of 5 and now plans to read The Boy with One Name by J R Wallis. A great read for 9-11 year olds but not a book I would chose to read again. Itâ€™s full of chocolate but I found pats did not keep my attention well. I would recommend this for people who like fantasy stories. Lucy gave The Dragon with a Chocolate Heart 4 out of 5 and now plans to read Letters from the Lighthouse by Emma Carroll. I liked it slot it was really fun to read aspecially when I was tired are sad I love to read. Jessica gave The Dragon with a Chocolate Heart 5 out of 5 and now plans to read The Boy with One Name by J R Wallis. An excellent read for 9-11 year olds, as it is full of action and deliciously crammed with chocolate. It does get a bit slow in the middle but makes up for it with a stupendous ending. I would definitely recommend it to anyone who loves fantasy, passion and above all, chocolate! Megan gave The Dragon with a Chocolate Heart 3 out of 5 and now plans to read The Explorer by Katherine Rundell. Aventurine is very adventurous and stubborn and she is my favourite character.I found this book interesting at the begging but at the middle it got quite boring. Bela gave The Dragon with a Chocolate Heart 2 out of 5 and now plans to read Just Call Me Spaghetti-Hoop Boy by Lara Williamson. This book was the absolute best. It was so touching and it tells you how two strangers can become best best friends. A dragon called Adventurine wanting to see show her family she can Hunt a human and bring him/her Back to the cavern but when she discovers hot chocolate everything changes! I would recommend this for people who LOVE FANTASY! Riya gave The Dragon with a Chocolate Heart 5 out of 5 and now plans to read Letters from the Lighthouse by Emma Carroll. This is an amazing book but as a person I don't really like it. I would recommend this to anyone who likes adventure and tense books. But out of everyone my favourite character was Adventurine because she's like a brave dragon who likes adventures. I rate this book 3 out of 5. Shelly gave The Dragon with a Chocolate Heart 3 out of 5 and now plans to read Letters from the Lighthouse by Emma Carroll. This book wasn't what I would like but anyone who loves fantasy and a little bit of adventure would love it.This book is about a dragon called Aventurine and he gets tricked by a food Mage.He is turned into a person and the story continues from there.My favourite character was Adventurine because she was so adventurous. Diya gave The Dragon with a Chocolate Heart 3 out of 5 and now plans to read The Boy with One Name by J R Wallis. I loved your book, it was outstanding. My favourite part was the bit when she turned into a human and got a fancy place to stay. You are amazing and very clever. Grace gave The Dragon with a Chocolate Heart 5 out of 5 and now plans to read The Boy with One Name by J R Wallis. This book is about a dragon called Adventurine she was tricked into drinking magical chocolate.It is about chocolate which i love it is also magical.I read it in ONE DAY i wish it never ended. Eliza gave The Dragon with a Chocolate Heart 5 out of 5 and now plans to read Letters from the Lighthouse by Emma Carroll. I love this book. This was is the most amazing and brilliant book I have ever read. The reason I like this book so much is because it keeps you on the edge at all times keeping the reading engaged into the book. Jaskiran gave The Dragon with a Chocolate Heart 5 out of 5 and now plans to read Letters from the Lighthouse by Emma Carroll. This book is one of the most amazing books I've ever read in my whole life. I literally love! !this book.The reason I love it so much is because it's like you thing something is going to happen but then it changes. Aadam gave The Dragon with a Chocolate Heart 5 out of 5 and now plans to read The Explorer by Katherine Rundell. The book quality is really good and entertaining. These are the type of stories that would make kids like me really get into the book. I recommend this book to anyone who likes adventure stories...and chocolate! Ravneet gave The Dragon with a Chocolate Heart 5 out of 5 and now plans to read The Boy with One Name by J R Wallis. This book is about a dragon called Aventurine who gets tricked into eating chocolate which turns her human. I loved this book because it is adventurous and it is about chocolate which I love. I wanted to keep on reading because I wanted to find out what happened next. Grace gave The Dragon with a Chocolate Heart 5 out of 5 and now plans to read Who Let the Gods Out? by Maz Evans. This book is about a dragon called Aventurine. She is the fiercest dragon in the mountains but not for long because a mischievous human tricks it into drinking a magical chocolate and becomes a HUMAN!! My favourite part of the book was the way Aventurine describes human clothing being exchanged for shoes "foot coverings" because she didn't understand anything human. I enjoyed the book because it was eventful and magical. I would recommend it to children who are aged 9-13. Ethan gave The Dragon with a Chocolate Heart 5 out of 5 and now plans to read The Explorer by Katherine Rundell. The Dragon with a chocolate heart is an amazing book! Adventurine is the fiercest dragon in the mountain, but when she drinks enchanted hot chocolate and turns into a human, what will happen to her and will she find her greatest passion, chocolate. Adventurine is a girl who was a dragon but was magically turned into a human ,however she has a dragon personality inside! Marina owns the chocolate heart Drachenburg ,Adventurine works there as an apprentice .Marina has a strong will and never gives up. Jasper loves philosophy. Fiona gave The Dragon with a Chocolate Heart 5 out of 5 and now plans to read Letters from the Lighthouse by Emma Carroll. Alex gave The Dragon with a Chocolate Heart 3 out of 5 and now plans to read Letters from the Lighthouse by Emma Carroll. I enjoyed this book but found it quite hard to get into .I really liked the main character and thought her name was quite unusual .The books name is grabbing and thats why I decided to read it first .The front cover is verry atractive to.I prefered the book towards the end to the start because I thought the beginning was confusing at times.There are lots of characters in this book which take some time to get used to and know what people the book is talking about. Esmae gave The Dragon with a Chocolate Heart 3 out of 5 and now plans to read The Explorer by Katherine Rundell. Amazing! this book is fantastic. It doesn't just tell you an amazing story, it teaches you not to wonder out by yourself. Everything is so well described. Eryn gave The Dragon with a Chocolate Heart 5 out of 5 and now plans to read The Explorer by Katherine Rundell. Lily-Rose gave The Dragon with a Chocolate Heart 3 out of 5 and now plans to read Who Let the Gods Out? by Maz Evans. It was very interesting but the girl was very short tempered. The blerb was very interesting. As I opened the first page it just took me to a different dimention. It was like going through a portal to the dragon's land and when the girl was riding the drago I really liked that bit. And when I finished it I never wanted it to end. Irish gave The Dragon with a Chocolate Heart 4 out of 5 and now plans to read Who Let the Gods Out? by Maz Evans. The book was permitted, but every page was a cliffhanger and a new adventure. I wasn't really affected by the plot line, but in the deadline it became captivating that's the logic of why its a 3. Theo gave The Dragon with a Chocolate Heart 3 out of 5 and now plans to read The Explorer by Katherine Rundell. The dragon with a chocolate heart was a very good book if I could I would read it again! But I would rate it a 4. It was a book about a dragon called Adventurine ( who is a girl ) had got told by her grandpa that it's better to eat her food than to talk to it and that hinted that you don't talk to humans before eating them, but Adventureine did talk to people and got tricked into drinking a magical hot chocolate and she became human. To put a picture in your head she was a 12-year-old girl with small teeth ,no fire, no gigantic wings and no claws to use in battle. But now she craves chocolate and finds an apprenticeship in a chocolate factory just so she can eat some chocolate . As I said a fab book and I would recommend it, good job Stephanie Burgis. Jack gave The Dragon with a Chocolate Heart 4 out of 5 and now plans to read The Boy with One Name by J R Wallis. Aventurine is a young dragon who gets tricked into eating a food mages hot chocolate. She drinks the hot chocolate and turns into a human who lives in Dachenburg. Her family comes looking for her and eventually finds her. I recommend this book for age 9 and above. My personal opinion is that I wouldn't normally pick up a fantasy book, but because it was so well written, I believed it all the way through. It was also described with every little detail so I new exactly what was going on. I loved this book and I will definitely read it again. This was an adventurous book and I would recommend it for other people. It was about a boy who wanted to prove his grand father wrong and say that dragons were real. He went to the mountains with his big brother Jasper, in which case he didnâ€™t want to go. However, the fierce dragon was tricked into drinking a enchanting chocolate and became a person. I loved this book and I want over people in the world to read it too. Maizy gave The Dragon with a Chocolate Heart 5 out of 5 and now plans to read The Boy with One Name by J R Wallis. Lois gave The Dragon with a Chocolate Heart 3 out of 5 and now plans to read Who Let the Gods Out? by Maz Evans. This book is really interesting and whenever I read it, it made my mouth water with the scent of chocolate. I would highly recommend this book to anyone who likes chocolate and dragons. Stefan gave The Dragon with a Chocolate Heart 5 out of 5 and now plans to read Just Call Me Spaghetti-Hoop Boy by Lara Williamson. I really enjoyed the book. I couldn't put it down. I love all the mystery and adventure. My favourite character was probably aventurine because I love her feisty character. The ending really suited the book. Hamna gave The Dragon with a Chocolate Heart 5 out of 5 and now plans to read Letters from the Lighthouse by Emma Carroll. The first sentence really hooked me into this book and I was soon reading and wouldn't stop until I finished. You can never judge a book by its cover. Katy gave The Dragon with a Chocolate Heart 4 out of 5 and now plans to read The Boy with One Name by J R Wallis. I really enjoyed the book. It is really funny book and the opening sentence is really good. You should read it.It is full of chocolate and just amazing! I would recommend this book to people who love, love, love, love,love fantasy books. Batool gave The Dragon with a Chocolate Heart 4 out of 5 and now plans to read The Explorer by Katherine Rundell. I haven't finished it yet but I found it quite interesting. The main character is Aventurine,she is a dragon but then she drinks hot chocolate and turns into a human. Bela gave The Dragon with a Chocolate Heart 3 out of 5 and now plans to read Letters from the Lighthouse by Emma Carroll. The Dragon with a chocolate heart is a heart warming tale about a dragon, Adventurine, who is tricked into drinking enchanted hot chocolate. The hot chocolate turns Adventurine into a human girl, so she goes to the city to look for chocolate. She becomes an assistant for a chocolate shop. This tale is hard to put down its so exciting, even though it made me hungry! Demimay gave The Dragon with a Chocolate Heart 5 out of 5 and now plans to read The Boy with One Name by J R Wallis. I really liked the ending of The Dragon With A Chocolate Heart but it was a bit boring in the middle but really good as I said. Brooke gave The Dragon with a Chocolate Heart 1 out of 5 and now plans to read The Boy with One Name by J R Wallis. I love this book.There are 245 pages and each is a cliff hanger.It is a mythical book, where a dragon called Adventurine who leaves the cave,not following her mothers rules which leads to a disastrous problem which includes a transformation between dragon and human.Read this book to see if Adventurine will be able to sort things out and be with her family as a dragon again. The main characters are Adventurine dragon/human,Silke the girl who without even knowing,became friends with a dragon,Marina, a woman who is kind and tough she also workes at the chocolate heart and Horst a man who workes at the chocolate heart and was not keen on Adventurine at first. The main settings are the cave,streets of Drachenburge, town hall and the Chocolate Heart. My favourite parts are when Adventurine finds her passion as a human and when she makes food for the King and his family. I would recommend this book to others who like mythical stories,dragons and chocolate. If you do,this is a book for you. Ellie gave The Dragon with a Chocolate Heart 5 out of 5 and now plans to read The Boy with One Name by J R Wallis. Adventurine is a dragon that has always been in the shadows of her brother and sister when she is tricked into drinking chocolate she realises her true passion.l rated it 4 because it had suspense but not the best ending.I recommend this book to people who love mystery and dragons. Freya gave The Dragon with a Chocolate Heart 4 out of 5 and now plans to read The Boy with One Name by J R Wallis. isabel gave The Dragon with a Chocolate Heart 4 out of 5 and now plans to read The Boy with One Name by J R Wallis. I loved how it was about stubborn dragons;I liked how it was a happy ending with things that worked out with the characters in the end. I would recommend this book for 8-13 year olds.The book was mostly like it was glued to my hands! The bit I didn't like was when Aventurine started working for Greta and the bit at the market square. Harriet gave The Dragon with a Chocolate Heart 4 out of 5 and now plans to read The Boy with One Name by J R Wallis. This book was very boring.I did not enjoy it. Hannah gave The Dragon with a Chocolate Heart 1 out of 5 and now plans to read The Boy with One Name by J R Wallis. Caseybree gave The Dragon with a Chocolate Heart 2 out of 5 and now plans to read Letters from the Lighthouse by Emma Carroll. When a young dragon called Aventurine meets a food mage who gets her to eat magic chocolate which turns her into a human and she goes to the city to become a chocolatier apprentice. But there are many problems around.I would say this book is for people who like adventure. Thomas gave The Dragon with a Chocolate Heart 3 out of 5 and now plans to read Just Call Me Spaghetti-Hoop Boy by Lara Williamson. I wholeheartedly enjoyed this book as it captivated me through a magical choclatey adventure. I think the start was a bit bland and could have been improved a bit, but otherwise it was fantastic to read. I would recommend this to anyone who loves: chocolate, adventure, fantasy and dragons. In my opinion this definitely deserves 4 stars for it's amazing descriptions and paragraphs. I can't wait o read more of the authors work. Megan gave The Dragon with a Chocolate Heart 4 out of 5 and now plans to read The Boy with One Name by J R Wallis. I really enjoyed this book and my favourite character is Adventurine because she is a dragon and she loves chocolate just like i do until something happens to her and changes her life. Elisabeth gave The Dragon with a Chocolate Heart 5 out of 5 and now plans to read The Explorer by Katherine Rundell. I have just finished reading the Dragon with a Chocolate Heart by Stephanie Burgis. It is about a dragon called Aventurine, who is tricked into drinking enchanted hot chocolate and becomes a human. Jasper, who is her older brother, enjoys philosophy and is always urging her to find her true passion. Will she ever find her true passion as a human? Overall, this was an amazing book and I give it 5 stars out of 5. Charlotte gave The Dragon with a Chocolate Heart 5 out of 5 and now plans to read The Boy with One Name by J R Wallis. I think this book was alright and that's why I have rated it a three out of five. At the start of the book, I thought it would be so boring, but as I kept reading it, it was becoming my kind of book (just a little). I like books that are a fantasy and stories where you have to use your own imagination. I would recommend this book for people who like reading imaginary/fantasy books. Naomi gave The Dragon with a Chocolate Heart 3 out of 5 and now plans to read The Boy with One Name by J R Wallis. Evie gave The Dragon with a Chocolate Heart 5 out of 5 and now plans to read Just Call Me Spaghetti-Hoop Boy by Lara Williamson. An amazing book beautiful description like this phrase blue sapphire claws thrashing around isn't that amazing it is like a trampoline with lots of ups and downs I would recommend this book for 7 to 13 year olds. Arthur gave The Dragon with a Chocolate Heart 5 out of 5 and now plans to read Who Let the Gods Out? by Maz Evans. The Dragon With A Chocolate Heart is a delicious,amazing and interesting story. The story is like a really fun roller-coaster with so many ups and downs.I suggest you read this because you will have a really good time. Peter gave The Dragon with a Chocolate Heart 4 out of 5 and now plans to read Just Call Me Spaghetti-Hoop Boy by Lara Williamson. 'The Dragon with a Chocolate Heart' is a deliciously heart-warming read, which makes you desperate to turn the chocolate coated pages. All 245 pages are packed full of excitement, magic and sugary confectionery. When Aventurine,the fear-some dragon, is tricked by a food mage into eating enchanted chocolate, she transforms into a puny human girl. In her new form, Aventurine searches Drachenburg for her new-found passion: chocolate. Along the way, Aventurine makes some surprising friends and attempts to use her chocolate to save her dragon family from extinction. Johnny gave The Dragon with a Chocolate Heart 4 out of 5 and now plans to read The Boy with One Name by J R Wallis. I love this book. I would recommend this to anyone who likes chocolate. I think Aventurine is a mysterious character. Her and her brother Jasper are named after jewels. Jessica gave The Dragon with a Chocolate Heart 5 out of 5 and now plans to read The Explorer by Katherine Rundell. I loved this book. I would definitely recommend this book who loves chocolate. My favourite character must be Aventurine because of her feisty personality. I thought the ending suited the book. Farhanah gave The Dragon with a Chocolate Heart 5 out of 5 and now plans to read Who Let the Gods Out? by Maz Evans. Adventurine is a young Dragon who is tricked into drinking enchanted hot chocolate. She realizes what she was made to do - eat chocolate! Making unlikely friends along the way, Adventurine wonders something- will she ever see her family again? This book is great for all ages, though I would reccomend 9-15. It is hard to understand in some places, but once you get into it, you are set for a rollercoaster of emotions! Hollie gave The Dragon with a Chocolate Heart 5 out of 5 and now plans to read The Explorer by Katherine Rundell. I love Aventurine and Jasper.I didn't realise until I finished the book that they were the names of crystals! I think I especially LOVE it because it is about dragons and it is fantasy.I think it is really nice that the people at the chocolate heart let Aventurine work there. I also don't like Greta. Mae gave The Dragon with a Chocolate Heart 5 out of 5 and now plans to read Who Let the Gods Out? by Maz Evans. I rated this book 4 out of 5 because every bit of it pulls you in more than the last. I have only read to chapter 5 and it is so intriguing. Harris gave The Dragon with a Chocolate Heart 4 out of 5 and now plans to read The Boy with One Name by J R Wallis. Milly gave The Dragon with a Chocolate Heart 4 out of 5 and now plans to read Letters from the Lighthouse by Emma Carroll. I have only read up to chapter 5,but I am hooked so far. This book is about a dragon; Adventurine wants to explore, but her Mother says every dragon who leaves a cave has to be 30.Adventurine wishes for the day to come. When Adventurine secretly leaves the cave, she meets someone down the path... Chapter1 to 5 in 4 words: Angry-fireballs encanted hot-chocolate and Dragon. Lily gave The Dragon with a Chocolate Heart 4 out of 5 and now plans to read Letters from the Lighthouse by Emma Carroll. Maddie gave The Dragon with a Chocolate Heart 4 out of 5 and now plans to read Letters from the Lighthouse by Emma Carroll. I have read into chapter 14 it took a while to like the book but now I've read more than half I think it is a great book. My favourite part is when Aventurine gets allowed to work in the chocolate heart with Marina and Horst. Sophie gave The Dragon with a Chocolate Heart 5 out of 5 and now plans to read Letters from the Lighthouse by Emma Carroll. Ella gave The Dragon with a Chocolate Heart 5 out of 5 and now plans to read The Boy with One Name by J R Wallis. Hi,I personally wouldn't choose this book to read if it was of my shelf. The reason I don't like this book is because I am not really into fantasy I usually read adventures books but I am going to carry on to see if I will change my mind. Poppy gave The Dragon with a Chocolate Heart 3 out of 5 and now plans to read Just Call Me Spaghetti-Hoop Boy by Lara Williamson. I am a fussy person with books but I really like this.It grasps me in so much even though I have only read to chapter 6. I can't wait to read the rest of the book. I am so much more gripped than I thought I would be. Sophia gave The Dragon with a Chocolate Heart 4 out of 5 and now plans to read Letters from the Lighthouse by Emma Carroll. I absolutely love this book,it hooked me in from the start. I am now on chapter 6 and Adventurine is just ran away from Greta and Friedrich. she has entered the city and is overwhelmed by the amount of humans. As i said i absolutely love this book. I have read 5 chapters of this book and so far I like it a bit. I rated this book 3 because it is not really the type of book I usually read. I am going to keep reading this book because I want to see if something exciting will happen in a few chapters. Molly gave The Dragon with a Chocolate Heart 3 out of 5 and now plans to read The Explorer by Katherine Rundell. I think this is a gripping book and it leaves you hanging on I give it a 4 because it is not the sort of book that I read all the time I normally read mystery but I am going to give it a go and carry on reading. Libby gave The Dragon with a Chocolate Heart 4 out of 5 and now plans to read The Explorer by Katherine Rundell.